From the middle-ages, right up to today, artists around the world have worked tirelessly to create stunning masterpieces continue to defy the rules of art and fittingly take their place at the forefront of creative expression. However, out of the millions of paintings that have been created and put on display in galleries and museums all around the world, only a small number become known as well-renown masterpieces. These are the works of art that are recognizable by almost anyone on the planet and that are true representations of their time. Below, we’ve put together a list of some ofthe world’s most influential oil paintings that can be found as reproductions at http://www.1st-art.com.Of course, these are only a few of the world’s most notable works of art. Each one of the artist’s mentioned below are only some of the artists that can be found on the website. 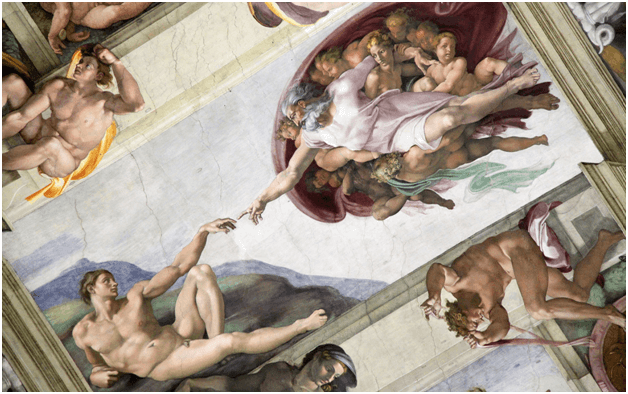 Starting in 1508, it took Michelangelo a total of four years to complete The Creation of Adam. The masterpiece, found on the ceiling of The Sistine Chapel located in the Vatican City, illustrates God giving life to Adam as part of the Biblical narrative of creation, and is just one out of nine stunning works painted on the chapel’s ceiling, each of which depict different scenes from the Book of Genesis. In 1642, in an effort to impress the French Queen who would soon be visiting the country,Captain FransBanninckCocqcommissioned Rembrandt to paint him and his Militia Company of District II. Known in Dutch as De Nachtwacht, Rembrandt created the piece by using oil on canvas to depict the militia captain and his 17 guards. The painting is currently on display at the Rijksmuseum in Amsterdam. Read more on Rembrandt here. Commonly referred to as the “Dutch Mona Lisa”, Girl with A Pearl Earring was painted by Johannes Vermeer and is believed to have been completed around the year 1665. It is currently on display at the Mauritshuis Art Gallery, located in the Hague, Netherlands. Believed to be one of the last self-portraits that he painted before his death in 1890, this painting is known as one of Van Gogh’s most well-known pieces and one of only a few that depict him without a beard on his face. The painting was completed in 1889, which Van Gogh gave to his mother for her birthday. Self-Portrait Without Beard is currently part of a private collection and has been regarded as one of the world’s most expensive paintings after being sold at auction for more than $71 million back in 1998. Executed around the year 1893, The Scream has become known as Edvard Munch’s most famous works of art. The frightening masterpiece was painted on cardboard using a combination of oil and pastel, which gives the piece its unmistakable mélange of colors, as well as a certain touch of surrealism. Today, The Scream can be found on display at The National Gallery located in the Munch’s home country of Norway. Known as Wood’s most well-known piece, American Gothic displays a man with a pitchfork standing next to a woman in front of an Americana style house. Wood painted the piece in 1930 and says that he was inspired to paint “the kind of people (he) fancied should live in that house”. The painting is currently on display at The Art Institute of Chicago, where it has been since its acquisition in 1930. Executed in 1931, The Persistence of Memory depicts the image of watches slowly melting over rocks and branches on a tree. Dali decided to use the both the concepts of hard and soft to create this masterpiece, which has become one of his most iconic pieces. He used the melting watches to represent the soft aspect of the work, while the rocks were meant to represent the hard aspects. The work is known as one of the most-famous Surrealism pieces and is currently being displayed at The Museum of Modern Art in New York City, USA. Completed by Picasso in the year 1937, Guernica has become known as one his all-time most famous works of art. Picasso painted the piece in Paris, France after being inspired by the bombing of the Spanish town of Guernica during the Spanish Civil War (1936-1939). During World War II, Picasso loaned the painting to The Museum of Modern Art in New York, where it remained until being brought back to Spain in 1981. The piece is currently on permanent display at the Museo Reina Sofia in Madrid.